How do Community Action leaders identify the needs of low-income people and use that knowledge to tailor programs to meet those needs? In what ways are low-income people involved in Community Action agencies (e.g. board or advisory council members, volunteers, employees, advocates)? What are the advantages and disadvantages associated with their participation? How do the leaders and their staff assess and demonstrate the effectiveness of their organizations and programs? What challenges do they encounter in assessing and communicating performance? What approaches are Community Action leaders using to diversify their revenues? What are the advantages and challenges associated with those approaches? How are the leaders developing their staffs and preparing for leadership succession? How do the leaders benefit from an affiliation with state and national associations? Through original and comprehensive research undertaken by the Center for State Policy and Leadership at the University of Illinois Springfield and the Illinois Association of Community Action Agencies (IACAA), this book is designed to inform and enhance leadership in Community Action agencies and other nonprofit or government organizations with similar missions. 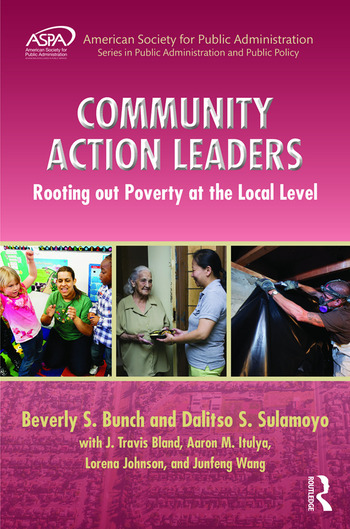 It is written in a nontechnical manner and includes a chapter on the history and evolution of Community Action agencies for readers who are unfamiliar with Community Action and the War on Poverty. It will be required reading for professionals working at the frontlines of income inequality, as well as university professors and their students in the fields of public administration, nonprofit management, and social work. Beverly S. Bunch is a Professor in the Public Administration Department and the Center for State Policy and Leadership at University of Illinois Springfield, USA. Dalitso S. Sulamoyo is the President/CEO of the Illinois Association of Community Action Agencies, a support organization to 40 nonprofit and public entities that address the effects of poverty throughout Illinois, USA. J. Travis Bland is an Assistant Professor in the Public Administration Department at the University of Illinois Springfield, USA. Aaron M. Itulya is the Chief Fiscal Officer of the Illinois Labor Relations Board, USA. Lorena Johnson is the Director of the Certified Public Manager Program of Illinois, a nationally accredited professional development program located at the University of Illinois Springfield, USA. Junfeng Wang is an Associate Professor in the Department of Public Administration at the University of Illinois Springfield, USA.